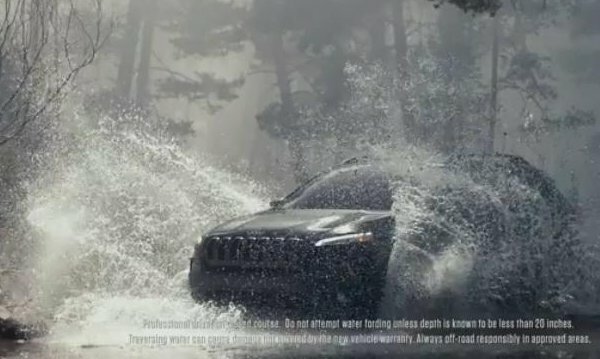 The tip of the 2014 Jeep Cherokee marketing iceberg is a 60 second television commercial that will debut across both broadcast and cable television channels including ABC, NBC, CBS, FOX, ESPN, TNT, the Big Ten Network, NBC Sports, Fox Sports One and NBA TV on some of the most watched shows and sporting broadcasts available – helping to put this quick moving commercial in front of a great many people. Unlike conventional automotive television advertisements that talk about the features of the vehicle or the things that the vehicle can help you do, the first 2014 Jeep Cherokee ad really doesn’t mention the vehicle at all. Instead, the first Cherokee ad is a heavily visual piece featuring a voiceover guy who is talking about how we all meet the world and then learn about the world. Throughout the video, there are subliminal messages with well timed wording, scenic views and quick glimpses of the 2014 Cherokee. Things like “see more” and “do more” are emphasized by the narrator while being accompanied by visually striking images showing the Cherokee driving off in the distance. This commercial doesn’t tell you that the 2014 Jeep Cherokee can go all of these places, instead showing something that many people would (in theory) like to do with the Cherokee in action so if you wanted to go to these places – the Cherokee can get you there. The “Built Free” :60-spot will break on Monday, October 28, across broadcast and cable television, including ABC, NBC, CBS, FOX, ESPN, TNT, Big Ten Network, NBC Sports, Fox Sports One and NBA TV, across programming such as "The Voice," "Blacklist," "Revenge," "X-Factor," "Agents of S.H.I.E.L.D," "Grimm," "Scandal," "Saturday Night Live," and high-rated sports programming including NFL and college football. A :30-second “Built Free” spot will begin running on broadcast and cable networks on Monday, November 11, including Discovery, E!, Bravo, History Channel, AMC, HGTV, National Geographic, and USA. Joining this first 60 second television advertisement, Chrysler will use unique in-theater commercials, print, digital (online) and future shorter television ads including a shorter version of the Built Free piece to promote the new 2014 Jeep Cherokee. I find this to be an interesting approach considering the fuss created by the design direction of the 2014 Cherokee. While it has its obvious Jeep cues, the look of the new Cherokee is unlike anything else from the brand or anything else on the market today. In other words, lots of people don’t like how the Cherokee looks but this new midsized SUV is greater than the sum of its parts with features like an advanced all wheel drive system, a new 3.2L Pentastar V6 and a 9-speed automatic transmission that should all work together to offer Jeep capability and incredible fuel economy. The 2014 Cherokee has lots of things to talk about in an average car commercial but Chrysler has decided to go a non-traditional route which almost seems fitting up this non-traditional Jeep. Looks like they totally ripped off the Toyota 4Runner campaign, but less successfully. What about the safely brake collision system? Will it stop automatic when going into a sudden impact? Will it stop like a foot away from the back of the car?